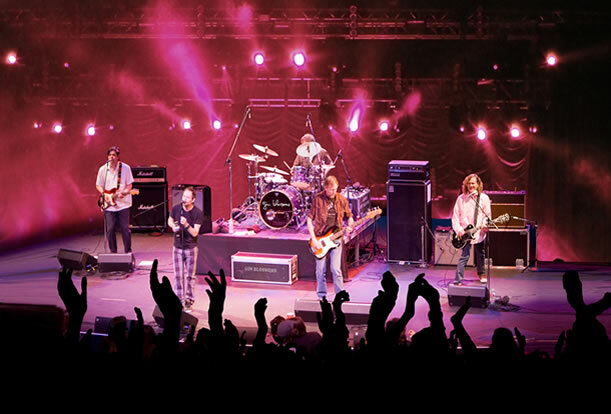 Since taking their name from a caption on a W.C. Fields photo and signing a record deal more than twenty years ago, Gin Blossoms have been synonymous with catchy melodies and jangle pop. But it was their breakout 1992 album, “New Miserable Experience” that solidified them on the charts for nearly three years and threw the band into the mainstream. With singles like “Hey Jealousy,” “Allison Road,” “Until I Fall Away,” and “Found Out About You”, New Miserable Experience went on to sell over 4 million copies and made the band a 90’s radio mainstay. After a four year hiatus that began in 1997, the band reunited in 2001 and continues to record and tour, performing as many as 120 shows a year. 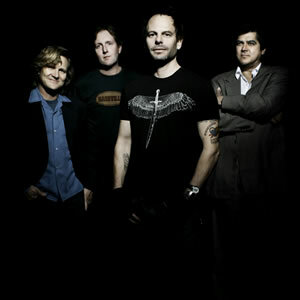 In 2010, Gin Blossoms: Robin Wilson (Lead Vocals/Guitar), Jesse Valenzuela (Vocals & Guitar), Scott Johnson (Guitar) and Bill Leen (Bass) released “No Chocolate Cake”, an album which shot straight to # 1 on Amazon, hitting Billboard’s top 200 at # 73 and the Indie chart at #14 and landing them back on the singles chart again with the single, “Miss Disarray”. 2013 will once again bring the band to over 100 cities, as well as a five-artist rock cruise, international shows and perhaps even another new album. The band is also partnering with Fretlight Guitars to give fans a chance to win an autographed Fretlight FG-421 at several stops during the Northeastern winter tour. I had the chance to speak with guitarist Jesse Valenzuela and get his thoughts on the origin, music and future plans of Gin Blossoms.